The Texas Auto Writer Association (TAWA) holds its annual Texas Truck Rodeo to pick out the best of the best in the segment. This year, Chevrolet and Ford skipped the event, which let Ram sweep the awards category, the Detroit Free Press reported. 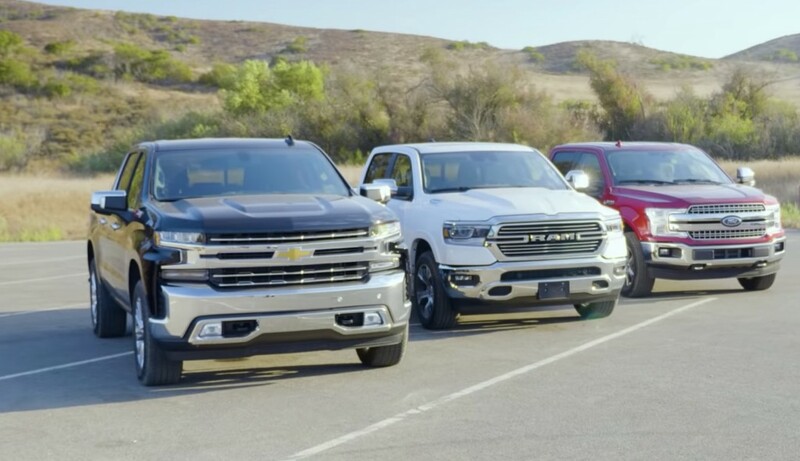 The 2019 Chevrolet Silverado and Ford F-150 were nowhere to be seen at the event, which led many TAWA members to believe the two didn’t believe they’d beat out the 2019 Ram 1500 regardless. “The sense was, they knew they wouldn’t win and tucked their tails between their legs and ran,” one member said of Chevy and Ford’s no-show behavior. Chevrolet skipped the Truck Rodeo for the first time last year, but this was the first time Ford didn’t participate. The TAWA and Truck Rodeo awards are highly coveted in the pickup truck segment’s largest market: Texas. It’s estimated one in five drivers own a pickup truck, and the awards make for excellent bragging rights for local advertisements. Both Chevy and Ford said they had other reasons to skip the event, and the Bowtie brand said it had other events to introduce auto writers to the new Silverado. However, those events don’t carry the 2019 Truck of Texas title, which TAWA awarded to the 2019 Ram 1500. Best powertrain: 2019 Ram 1500 eTorque 48-volt mild hybrid. Ram earned the first coveted award of the season. Now, all eyes are on Motor Trend’s Truck of the Year competition and the North American Truck of the Year award. Don’t understand why you would spend billions designing a new pickup and not make it the leader of the pack. To make it better in a few areas and miss so many more is beyond belief. Or perhaps this event doesn’t register as important to them and TAWA crying about it doesn’t help. Sounds like it’s not nearly as coveted as they’d like to think. They and Ford didn’t go last year either it sounds like. Personally I’ve never heard of it and probably never will again. I never heard of TAWA so it makes no difference to me weather Ford or Chevy copped out. New Silverado looks sharper in person than in pictures. Its got a good look to it. Ram in person look dull and old. It doesn’t look sharp it has a boring look to it. I have seen the new Chevy and have to admit the it looks pretty sharp exterior wise. But it going to take more than exterior styling to make it the top dog. As I said before its missing a few ingredients to accomplish that. The 2019 Ram’s exterior is bland and forgettable. Ram ruined the truck when they replaced the iconic crosshair grille. I don’t understand why people think it’s a good looking design. Ford brags in it’s commericals it is voted the best truck in Texas. I guess they knew they had no chance of winning again. And they scared them off with an interior that isn’t all hard, shiny plastic. Good for them. GM had soft touch dashboards in their trucks 45 years ago; the fisher price stuff they shove in our faces today in the name of profit is an insult considering the price range. Ford may even be worse as they also include mismatched colors and horrendous fake wood well into the $60k range and beyond. It’s a shame that the soft touch interior in the 2019 Ram is severely lacking when it comes to fix and finish. So far these 2019 trucks are falling apart even worse than the outgoing Ram 1500’s did. But the glitter of a soft touch interior and flashy 12″ touchscreen seems to have caught the hearts of auto journalists that maybe spent a day in the truck before writing a glowing review. The long-term testing reports for the 2019 Ram 1500 by C&D/Edmunds/Motortrend should be good for a laugh when they talk about the leaking roof, barely functioning AC system, loose trim pieces, and constant dealer visits. Ford current F-150 is one of the worst in terms of quality. You know the plastic they use for the dash and glovebox is cheap when they start warping while they sit on dealer lots. This is just another affirmation from GM (and other OE’s) that car shows and other live, “in-person” types of events are becoming less important in selling new cars & trucks – of all types. The benefits just don’t outweigh the costs.